The aims of this study were to assess quantitatively the enzymatic ability of squid to digest lipids and the ability of the digestive gland to accumulate lipid classes associated with storage. This was achieved through two manipulative experiments using the dumpling squid, Euprymna tasmanica. Firstly, we measured lipase activity and determined the presence and location of lipid vacuoles within the digestive gland; secondly we identified and quantified lipid classes in the digestive gland. Given the levels of lipase activity, we provided evidence for the first time that a squid species is capable of digesting lipid at levels comparable to invertebrates known to use dietary lipid. A poor relationship between feeding activity and lipase secretion suggests that enzyme production is continuous. The second experiment found no evidence that lipid was stored in the digestive gland; most of the lipid present in the gland was either structural or a dietary by-product. The implication of these findings is that for this species lipid is most probably being immediately digested and used for growth and reproduction rather than being stored in the digestive gland. 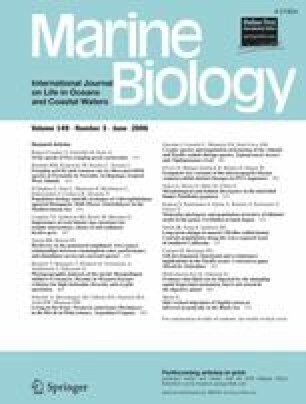 We consider that the role and storage of lipid is likely to vary among different cephalopod species, but not predictably as function of their lifestyle. Therefore, potential locations for lipid storage, other than the digestive gland, need to be considered and using changes in the relative size of the digestive gland as a measure of condition needs to be interpreted with care. This project was funded by the University Internal Research Grant Scheme. We thank D. Sinn and T. Fox-Smith for assistance in collection of animals, and K. Swift for assistance in the experiments. Collection, handling and killing procedures cleared by University of Tasmania Animal Ethics Committee, Permit #A0006998.